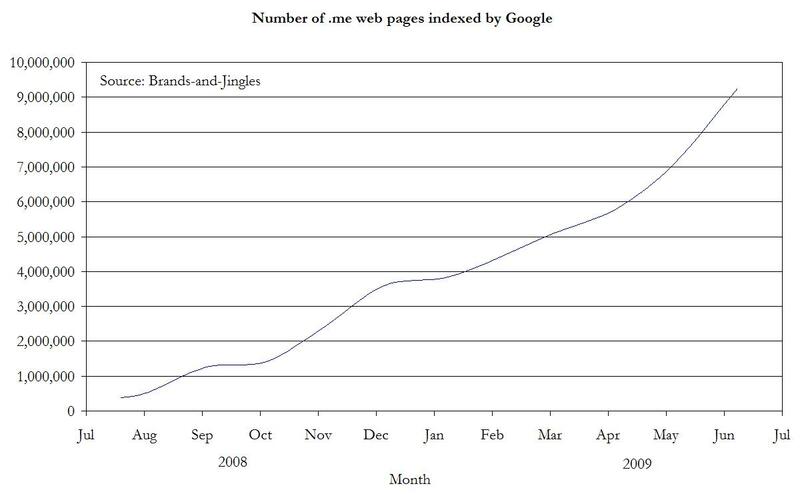 Every half a year Brands-and-Jingles shares the data they gather since the inception of .ME on number of .me web pages indexed by Google. In less than a year .me became more popular than .aero, .asia, .coop, .jobs, .int, .mil, .museum, .name, .pro, .tel, .travel and other 200 country code top-level domains. Since the beginning of the year, it kept its position of the fastest growing top-level-domain and is still rising. Another good metric would be to look on number of indexed pages. At the moment, an average .me site has ~ 40 pages compared to ~ 400 pages per site for an average .com – plenty of room to grow. If .me keeps the momentum, with 1 million pages over three years it will have some 200 millions indexed pages that will place it on the level of .eu, .tv, .info etc. 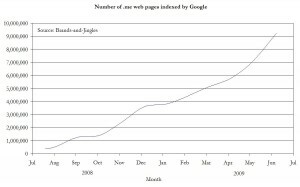 Looks like the number of indexed pages was doubling every four months. If the pace is kept – by the end of 2010 there will be 200 million pages – probably an unlike figure, but number in the area of 100 million is pretty possible. .ME started 2010 with 50+ million pages. It only needs to double. Let us see how it goes. In January .me had already 58+ million pages. Keeping the pace. Though, it is still # 80 in the global TLD list.